They say behind every great man is a great woman. But we’ve found that behind some great restaurants is a great man and a great woman. Smoke, one of Baltimore’s buzziest eateries, comes to us courtesy of coupledom—engaged duo Josh White and Hope Seidl run Smoke from top to bottom. When asked what it’s like working with his fiance, Chef Josh said “I love it. We have the same vision so that helps tremendously. We are smoke, and each other’s biggest fans.“ And that folks, is the key to success. Believing in one another, and the product so passionately, that it translates into your brand. Josh and Hope started dating and fell in love instantly during the earlier part of 2016, while Josh was actually planning Smoke. They spent the summer running errands to Home Depot, and the restaurant store, dotted with days by the pool and late summer nights. Smoke opened in October 2016, and during that first year Hope wasn’t so “hands on”. She was Josh’s biggest cheerleader and number one support system. During the second year Hope actually became a part of the company, and started taking some of the biggest responsibilities, that Josh admittedly just didn’t have the time for. (Bookkeeping, social media, marketing, organizing events, networking, etc.) You see, he is the creative force behind every aspect at smoke. She’s the grease that makes all the wheels turn, and helps bring his vision to life. You won’t know if working with your partner is for you unless you try it, but according to Chef Josh if your partner is your best friend, it will work out just fine. 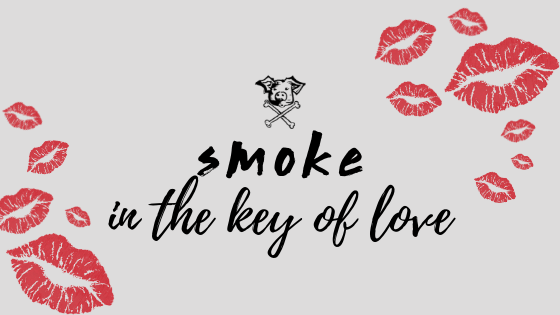 Join Josh and Hope for Smoke in the Key of Love, Chef Josh White’s ode to love, via food. We will be offering 3 seatings on Thursday February 14, Valentine’s Day, 2019. Come and enjoy a 3 course meal hand prepared and smoked with love. Treat your significant other to a Valentine’s experience like they’ve never seen! Enjoy “Love” themed playlists, fun decorations, and drink mixes for your BYOB fun! We will only be releasing a limited amount of seats for this event! Tickets will go on sale soon! RSVP to the facebook event below to be the first to know when tickets are available!